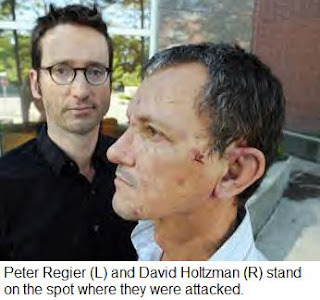 Two thugs viciously assaulted David Holtzman and his partner, Peter Regier, as they tried to enter their townhouse on Keefer Street at around 10:45 p.m Saturday night in Vancouver, BC. “We were out at a concert and came home and found two guys on our steps peeing against the wall,” Holtzman told The Province. The man replied with extremely vulgar, anti-gay invective, he said. Holtzman said he and Regier were attacked without provocation. He received about 50 punches to his head and body and was twice bitten by his attacker. Both Holtzman and Regier suffered concussions, with Regier beaten so viciously he was taken to hospital, where surgical staples were put in his head to close a wound. “We were not fighting,” insisted Holtzman. “We were not looking for a fight at all. “I was just minding my own business, suggesting someone not treat our front door as a toilet, and got attacked,” said Holtzman.